1How do I book a sail? When are your public sails? For information about our public sail schedule and making reservations, see our Public Sails page. For information about chartering the Nathan, visit our Charters page. A sailing trip on the Nathan of Dorchester is a unique experience and we often sell out in advance. We strongly recommend you make a reservation. 2Where is the boat? How do I find it? The boat is located at the foot of High Street in Cambridge Follow the signs to the Nathan or the lighthouse. We are the only skipjack around that has an “N” on our bowsprit and a gold ball at the top of our mast. Summer traffic can be heavy, so allow plenty of time to get to Cambridge. Please plan your departure so you can arrive at the boat 15 minutes before we leave the dock. That will leave time to wind down from your drive and to use the public restrooms at Long Wharf located near the boat. 4What do I do if I'm running late? Make sure you call us at 410-228-7141. In consideration of our other passengers, we can only hold the boat for a few minutes after our scheduled departure. 5I called for a reservation, but only got an answering machine. Can I talk to a real person? Our volunteers handling reservations work from their own homes, so all calls come in to our voice mail. 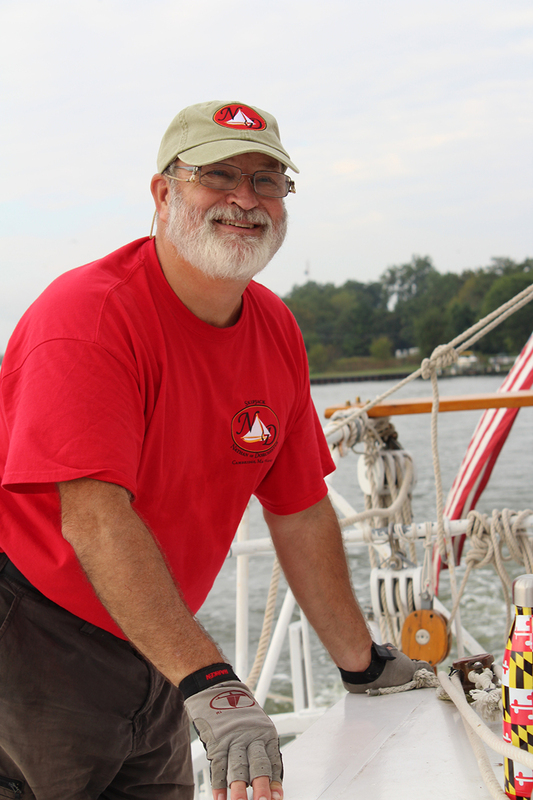 Our volunteers check the voice mail and email frequently during our sailing season! All calls are returned promptly. 6Can I pay for reservations by credit card? Yes, if you make reservations online for one of our public sails. You may use Paypal or any major credit card. Unfortunately, we only accept cash or checks for any last minute payments made at the dock. That depends on the weather. Remember that it is almost always cooler out on the water and there can be a mild wind-chill effect. Even on hot days, you may want to bring a light jacket or sweater. There is little shade on the boat, so be sure to wear a hat and sunglasses on sunny days. Remember that children need appropriate attire and sun protection. For your comfort, we provide cold water and sunscreen. 8What kind of shoes should I wear? To be safe and comfortable, we recommend that you wear sneakers or other soft-sole shoes. The boat moves about so shoes with dark leather soles tend to get slippery. If you wear open-toed shoes or sandals, please be careful of the many metal fittings on deck that can cut unprotected toes. For your safety, please do not wear high heels. 9Is the trip suitable for children? Yes! A sail on the Nathan is great for people of all ages. All children must be accompanied by an adult. Children sail at a reduced ticket price based on their age. If your little ones get antsy, bring something to entertain them while your family enjoys the sailing experience. Our docents will get the kids involved during the sail, especially when we haul up the dredge full of oysters! 10Can my kids wear their own life jackets? We have Coast Guard approved life jackets in sizes to fit even the littlest sailor. The Coast Guard requires that the life jackets used on the boat bear the name of the vessel, so all children 12 and under must wear one of our life vests. 11Can you accommodate passengers with disabilities? We regularly accommodate people in wheelchairs or who have limited mobility. We have a ramp and our crew is trained to assist passengers with disabilities. Our marine head (restroom) is not handicapped accessible. If you need assistance, be sure to mention it when you make your reservation so the crew is prepared to help. 12Can I bring my pet with me? We allow service dogs to accompany passengers with disabilities. The Nathan is an open boat, space is limited and other pets are not allowed. 13Can we bring alcoholic beverages? You are welcome to bring beer and wine only on charters and special sailing events, but please use plastic rather than glassware. We don’t allow alcoholic beverages on the public sails out of consideration for the other passengers. 1Are there pearls in the oysters? While all oysters are capable of producing pearls, you rarely find them in the Chesapeake Bay’s oysters, and the few found are usually quite tiny. 2Can we eat the oysters you dredge up? The oysters are edible, even in months without an “R” in them, but our Department of Natural Resources license requires us to put the oysters back on the bed where we found them. So don’t bring your hot sauce unless you bring your own oysters! 3Will we dredge for oysters? We dredge for oysters on our two-hour public sails and charters out of Cambridge. If the wind cooperates, we will even dredge under sail like they did 100 years ago. Skipjacks were designed to be very stable dredging platforms. The Nathan doesn’t heel over like round-hulled sailboats, so you don’t have to worry about tippy decks. If you are concerned about seasickness, you may want to consider taking something for motion sickness before coming onboard. 5Would the trip be canceled if it rains, is too hot or if it is too windy? Safety and passenger comfort are the most important consideration. The captain will cancel any trip if the weather causes safety concerns. If it is just too miserable for passenger comfort, we will cancel. If there is just a slight chance of light rain and if safety is not an issue, we will not cancel a public sail or charter. However, if a sail is canceled, we try to give passengers as much notice as possible, which is why it is important that you provide a cell phone number when making public sail reservations or chartering the boat. 6What happens if it rains? We carefully watch the weather, and inform all passengers of any cancellation or delay. The Nathan is an open boat, without protection from the elements. If there is a chance of light rain, be sure to bring or wear rain gear. Umbrellas aren’t practical on a sail boat. 7What is there to do on the boat? We dredge for oysters, our docent tells stories, and answers your questions. Weather permitting, we’ll let you steer the boat as we all enjoy the relaxing beauty of sailing on the river. 8Do you serve food on board? While the traditional skipjacks carried a cook on board to keep the crew well fed, we do not. You are welcome to bring your own food and non alcoholic beverages.on Saturday sails. If you charter the Nathan, bring whatever you want in the way of food or beverages. 9How far is the Bay? How far do you sail? The Chesapeake Bay is about 15 miles down the Choptank River from Cambridge. 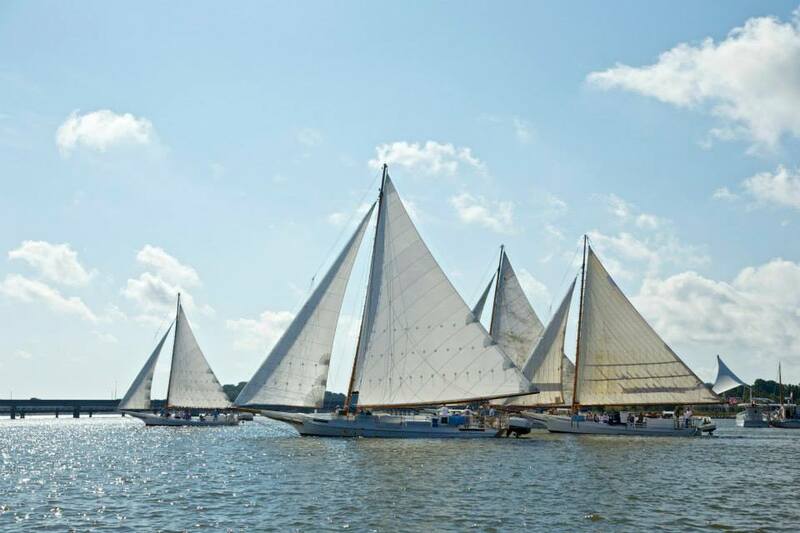 As this is too far for us to go on a two-hour sail, we just go out into the Choptank and sail a couple miles down the river to some oyster beds and then sail back. The distance depends upon where the oysters are and sailing conditions. Have another question? Complete the form and we will be respond in a jiffy! Great sail on 60+ foot Skipjack on Chesapeake Bay! Loved it! We even dredged for oysters! Kids got to hold them, even caught a crab! We'll be back!!! © 2019 Skipjack Nathan of Dorchester. All Rights Reserved.